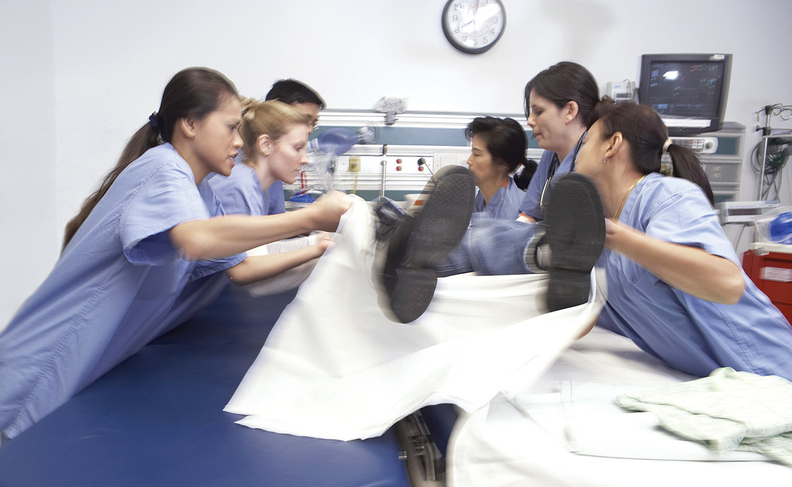 Nearly half of all hospital staff injuries are caused by lifting, bending or reaching. American political dynamics around healthcare and other issues could be changed by a U.S. Supreme Court decision Wednesday that significantly weakens public-sector labor unions. In a ruling with major ramifications for healthcare organizations, a bitterly split high court ruled that public-sector unions cannot collect mandatory service fees from members for representing them in contract negotiations. Both liberal and conservative analysts said the high court's ruling could hurt the Democratic Party—which draws contributions and foot soldiers from the public-sector unions—and weaken political advocacy for government programs including healthcare. "Americans who want a vibrant public sector will have to find ways to organize in other ways, not just through public-sector unions," said Theda Skocpol, a professor of government at Harvard University. The majority decision, written by Justice Samuel Alito, said unions cannot force nonmembers to "subsidize private speech on matters of substantial public concern" under the First Amendment. The 5-4 ruling overturned the high court's long-standing precedent that allowed unions to collect these so-called agency fees, which are used to support collective bargaining activities and other representation activities, including legislative advocacy, grievance and worker safety programs. The majority, consisting of Alito, Chief Justice John Roberts, and Justices Anthony Kennedy, Clarence Thomas and Neil Gorsuch, said forcing nonmembers to pay for those activities should be considered compelled speech. "The First Amendment is violated when money is taken from nonconsenting employees for a public-sector union; employees must choose to support the union before anything is taken from them," Alito wrote. While the majority opinion was not surprising to legal observers, it unexpectedly made public-sector union membership an opt-in rather than opt-out choice for new members. That likely will further reduce the number of dues-paying members. The Janus ruling applies to public-sector unions in the 22 states that allow unions to collect mandatory agency fees from employees in the bargaining unit. Fees to cover a union's political activities already were optional under a previous Supreme Court ruling. Unions—which represented 7.9 million, or 34.4%, of public employees in 2017 compared with 8.5 million, or 10.7%, of employees in the private sector—are one of the strongest political forces advocating for protecting Medicare, Medicaid and other social programs. Overall, nearly 1.5 million workers in healthcare occupations are represented by unions, according to the U.S. Bureau of Labor Statistics. In states that allow mandatory agency fees, membership in public-sector unions averages 53.7%, much higher than in states that don't allow it. Researchers say rates of union membership have a direct political impact. One study found that state right-to-work laws that reduce union membership shrank Democratic presidential candidates' vote shares by 3.5% in elections from 1980 through 2016. The plaintiff in the Supreme Court case, Mark Janus, an Illinois child support enforcement specialist, argued that the First Amendment protects his right not to pay a $45 a month fee to the American Federation of State, County and Municipal Employees to represent him. He claimed he disagreed with the union when it was bargaining with Illinois, feeling that the cash-strapped state needed to save money on salaries and health insurance. Illinois Attorney General Lisa Madigan, a Democrat, defended the unions' ability to collect the fees, arguing the only relevant question was whether a restriction on an employee's speech affects the employee's ability "to speak as a citizen on a matter of public concern." Administrators of public-sector healthcare systems had mixed feelings about the case. Public hospital systems in Los Angeles, New York City and San Francisco filed amicus briefs supporting the unions' position. While some public system leaders may welcome seeing unions weakened by loss of fee revenue, others fear that would hurt public health efforts. They know that unions are the strongest advocates for maintaining funding for their agencies. "Access to public services will be negatively impacted," said David Johnson, national field director for National Nurses United. Dr. Mitchell Katz, CEO of NYC Health & Hospitals, described the Janus decision as "unfortunate," saying his public hospital system has "vital and effective collaborations" with unions. "We expect labor organizations to continue to remain a force in working together with us to improve care to our patients, build a supportive workplace for our employees and shape our shared vision for a stronger, more resilient public healthcare system that will serve many more generations of New Yorkers," he said in a statement. Union leaders say they saw this decision coming and have been working hard to build stronger support among their members. "Nurses will continue to fight for patients," Johnson said. "This won't change that. It may spur new union organization by making nurses angry." Employers will be able to use the Janus ruling to weaken or even decertify unions if that's what they want, according to Jon Anderson, a partner with Godfrey & Kahn in Madison, Wis., who represents hospitals and public agencies that deal with unions. Employers will have increased ability to assess a union's support among workers based on the percentage paying agency fees. On the other hand, he predicted that unions will become more aggressive both politically and in their representation of their members, and likely will redouble their efforts to market the benefits of unionization to workers. Harvard's Skocpol doubted the ruling will diminish unions' political muscle in the November elections. Beyond that, she said it could force progressives to organize more effectively outside unions to advocate for healthcare and other public programs. "That could be a silver lining, because we could see a broader array of citizen movements taking some of the space of unions," she said.